In the great state of Alabama, there are hundreds of roadside rib joints clamoring for that country money. Some good, some bad, and some utterly majestic like Archibald’s in Northport. George Archibald puts out the finest smoked pork I ever put in my mouth. His tiny (seats 6) cinder block meat house butts heads with Jim n Nick’s in round 1 of Alabama’s Quest For The Best Barbecue competition that kicks off Monday March 11th 2013. Here’s the bracket. We’ll post updates as warranted. Turns out the fix was in. Archibald’s, the barbecue joint that in-the-know connoisseurs believe to be the finest smoked meat shack in USA was unceremoniously ousted in round one by Jim n Nicks, the chain that got its start in Birmingham. I lived one block from Jim n Nick’s Clairmont Road location for 2 years back in the 90s. It was serviceable…barely. Jim n Nick’s moves on to round two where they square off vs Full Moon, formerly Pat James Full Moon. It’s chain vs chain as Full Moon locations are scattered all over central Alabama. 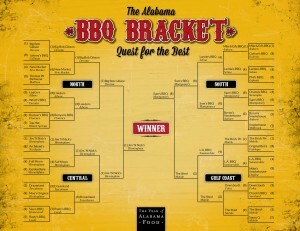 More than 50k people have cast their votes in this competition and now the bracket has been reduced to 4 restaurants: Big Bob Gibson in Decatur, Jim `N Nick’s in Birmingham, Sam’s BBQ in Montgomery and The Shed in Mobile. Let’s face reality. The fact that Archibald’s in Northport is not in the final four renders the entire contest a farce-a dog and pony show-little more than flexing amongst restaurants that have staunch social media skills. Interestingly Jim n Nick’s moved into the final four via beating Dreamland by 19 votes with over 7k cast! More than 75,000 votes have been cast so far in this tournament. Now we’re down to the final 2 combatants: Jim n Nick’s of Birmingham, who bested Big Bob Gibson’s of Decatur, and Sam’s Bar-B-Q who beat the Shed Barbeque & Blues Joint of Mobile. Meanwhile George Archibald continues putting out the finest barbecue in the Deep South at his little 6 seater down in Northport Alabama. This entry was posted in FOOD, The Foodist and tagged alabama barbecue, archibald's barbecue, barbecue, birmingham alabama, full moon barbecue, northport alabama, the Shed Barbeque & Blues Joint of Mobile. Bookmark the permalink.